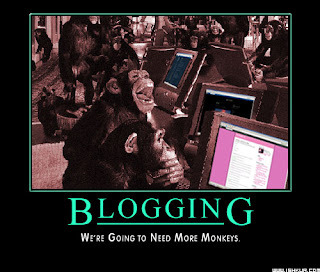 Angela Kulig: Do you have a blog I should be following? Do you have a blog I should be following? I will admit, I am really AWFUL about following peoples blogs back. I tend to catch new posts via Twitter, which occasionally get lost in my insane feed. Anyway, if you have a blog I--or anyone else who reads this post should check out leave your linkage in the comments. Be forewarned though, if you post anything you shouldn't I will delete it. PS--the monkeys are actually an old joke from a Guest Post Mike Mullin did on my blog back in the day. You can see it here. No, I don't actually have monkeys that write my books for me. That would be nice. You could out-perform the pack of monkeys anyway. All followed! But Lar--I think I should be flogged for not following your blog BUT I never miss anything because I talk to you all the time. Well *I* certainly think you should be following my blog, but your opinion may differ. This is because it has many followers. According to the company that owns this social media network, buy twitter followers has unique accounts spanning to tens of millions. MWWM: MEMORIAL WEEKEND WORD MARATHON sign ups! So many updates, so little time.